At IDRSolutions we have a combined Swing and JavaFX PDFViewer. In previous JavaFX articles I have shown How to Create Stacked Menus in JavaFX and How to Create a Border Glow Effect in JavaFX. 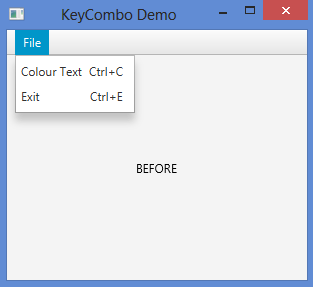 In this tutorial I will be showing you how to setup and chain key combinations/keyboard shortcuts in JavaFX. We will be learning how to use the keys Cntrl + E to call a MenuItem Accelerator which will exit the application and Cntrl + C which will set the style of a Text Object. By the end of this tutorial you should have a solid understanding of how to setup your own Key Combinations and time them to an accelerator in JavaFX. I will assume you have a basic understanding of JavaFX and how to setup and add to a Stage. Firstly we will create some text and pin it to the center of a BorderPane. We need to create some MenuItem objects to tie key accelerators/combinations to them, however MenuItems need a Menu to contain them and a Menu has to be added to a MenuBar for our main menu to appear at the top of our application, so lets code them in. We now want to add some MenuItem event handlers which will be triggered by our Key Combinations, lets code them in. Lastly, we will add our Key Combinations, when we press Cntrl + E it will Exit the application and when we press Cntrl + C it will style our text (Change the Colour and Font). If you have followed this tutorial correctly then see bellow for some before and after shots of using the Cntrl + C Key Combination, you should see something similar. With some hope you can now add your own Key Combinations to your JavaFX Applications and have learnt something new! Please let us know below if you have anything to add or wish to leave a comment. How to Create a Border Glow Effect in JavaFX. After calling setHtmlText() can we set the cursor at last selection? Shortcut does not work when focus is on text field… What to do? Thank you. This helped me. You can explain the following line because understanding this one taking extra time to me(mainly KeyCombination.CONTROL_DOWN).